I love the pic of the Brabham you selected for this article. Look at the elegant lines, the lack of complication in the design. It’s simple and superb. Not a blemish visible on the strict midnight blue and white colourscheme. Normally, I’d select a JPS Lotus as the most elegant F1 car of all time, but this Parmalat Brabham comes close, very close. I agree wholeheartedly, except that I consider the Brabham BT49 to be better than any Lotus ever produced. Nothing before or since has been so pure, elegant and satisfying to the eye as the BT49. In fact, Keith's photo does not show the car at its best; so effective was it that, for the first time in over ten years, the team was able to remove the front wing entirely for some races, thus demonstrating how completely the Brabham's designer, Gordon Murray, had mastered the art of ground effect. It also showed off the car's clean lines to greatest advantage. The year was the occasion of Nelson Piquet's first championship, 1981. 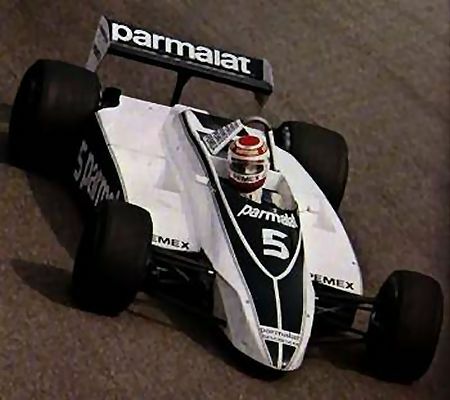 One or two other teams were able to race without front wings that year, but none so often as the Brabham. That season was the result of two year's hard work for the team and the driver and their championship was deserved as no medal system would appreciate, judging by the FIA's analysis. To my eye, the cars of that period, the ground effect era, are amongst the prettiest racing cars ever built and it is interesting to compare them to the designs for 2009. We see immediately how the new regulations have forced designs to return to a cleaner and less cluttered look but the wings seem to have gone mad in the meantime. In 1981 front wings were disappearing, now they are expanding into barn doors. And the rear wing has begun to shrink and tower above the car, whereas the '81 version was low, wide and flat. Such are the anomalies that occur when design is regulation-driven rather than inspired by innovation. I know that we can never go back to skirts and ground effect again - with today's wind tunnels, the designers would build cars so impossibly quick around corners that the drivers would have to wear g-suits. But for those few years we were reminded that the ideal was to remove wings, that it might be possible that such ugly add-ons could be dispensed with entirely. We are used to them now and those who have never seen F1 cars without them seem to think them essential, but wings are really just an interim arrangement, a temporary measure while the designers think of something better. They came close in 1981 and could do so again, if only we were to get away from the idea that everything must be regulated and that the real designers are the FIA rule makers. I think the Ferrari Sharknose was the smoothest looking design. The Sharknose was a classic, I agree, but it gets a little out of proportion at the rear. Too much rear overhang, I think. Moss's Vanwall looked terrible - ungainly and out of proportion. I really liked the post-ground effects Brabham BT52 that almost completely did away with sidepods - it was like a dart or air-to-ait missile! Gordon Murray never ceased trying to innovate through the 80's. I find the Championship winning Lotus the best looking ground effects car and the 7-up sponsored, green Jordon the best looking F1 car ever. A formula 1 car without a wing. Oh joy. It is a shame the politics of the time dictated that the future of F1 head of in a foolish direction. The BT49 is not one of my favourite although I understand the appeal. The Lotus 79 or Williams FW07 even with their wings just looked right. The twin chassis Lotus 88 http://en.wikipedia.org/wiki/File:Lotus88.jpg was for me possibly the best looking of the cars to run without nose wings. The photo doesn't really do it justice. Had there not been the turbo/ground effect trade off a level of ground effect could have been retained in the regs and wings eliminated completely. Downforce created by the underbody is a lot less succeptible to disruption than downforce created by wings. It is a shame the Balestre and Ecclestone took such a partisan approach to their negotiations rather than trying to work out what was best for the sport as a whole. I wish I could correct the typo in my original comment! It should of couse, be "lack of complication" rather than "lack or complication". Must admit that I'm with Timbo on the Vanwall - I think it looks bulbous and the body is too big for the wheels. The Brabham BT52 was an amazing sight with its similarity to a dart but I think its predecessor, the BT50 was more elegant. It's my opinion, as I said in the article, that the BT49 just shades the Lotus 79 for looks, although the JPS color scheme is a huge advantage, of course. Hounslow: I can edit my own post and have done so but, unfortunately, can do nothing about the original comment on F1 Fanatic. Keith would be happy to fix it, I'm sure. Brabham, Williams, Lotus, all beautiful cars. much better looking than today's dreck. I was lucky enough to see all these cars in action. But when I think of really beautiful F1 cars, I always picture the wingless Lotus 33 and the Spa winning Eagle-Westlake. Poetry in metal. As I've been lucky enough to actually TOUCH a Vanwall, my vote is biased, but my vote must go to that British creation. Of course I'm a old goat, I'm from the era when we could SEE the drivers, DRIVING! And couldn't "prettiest ever built" include the 1959 Aston-Martin DBR1 or 1958 Ferrari Testa Rosa. Oppps! No ground effects. Beauty is in the eye of the beholder ..... no matter what class or era. My remarks were indeed limited to the ground effect era in F1, Number 38. Although Jim Hall had produced a series of (pretty ugly) ground effect Chapparals in the early seventies, the ideas did not invade F1 until later in the decade. Chapman's first attempt at a ground effect car, the Lotus 78, was not very pretty too but, when he finally got it right with the 79, the car was beautiful - simple, clean and effective. As for being the prettiest car ever built, it is a matter of taste, of course, but I do rate the BT49 as one of the best of all time. I also agree with the majority who declare the Maserati 250F to have been the best-looking F1 car of all time. When it comes to road cars, however, my vote must go to the accidentally beautiful Ferrari 250 GTO. Designed for the road but intended for racing, it was the product of several designers in succession and should have been a mess therefore - but somehow it came out as perfectly-proportioned and balanced, a real joy to behold. I remember reading an interview with Frank Williams (I think it was) about 2 or 3 years ago, in which he said that before Ground effects was banned they had already been investigating using G-suits. I will admit I miss the design freedom of those days, remember the Brabham fan car? the rather odd looking Ferrari's of the late seventies ? etc. and thats what really annoys and frustrates me at the moment for the first time in years there is a genuine engineering challenge being offered to the teams and a lot of fans who reminisce about the days of total freedom are whinging about the introduction of KERS, it seems completly hypocritical to me. I have vague recollections of G-suits being suggested for F1 too, George. If nothing else, that should be a reminder to us of how necessary it was to ban the use of ground effect somehow. The problem with KERS and the reason for its unpopularity in F1 circles is that it has not been introduced to make the cars handle better or go faster - it is essentially an attempt to make the sport look more environment-friendly than it is. As such, it is an artificial engineering challenge that does not belong in the sport. To make it even partially relevant to racing, we have to talk of push-to-pass buttons, something that runs counter to the spirit of F1. All previous engineering advances and inventions were directed at making the cars quicker than the competition - they were all part of the F1 designer's drive to get an advantage over the rest. KERS is nothing of the kind, as evidenced by the fact that Mosley is now talking of having a standard system for all teams in 2010. Not much competition and engineering innovation in that, is there?